1. Support H.264/PSP AVC encoding/decoding, APE and CUE decoding, audio CD ripping. 2. Zoom and split functions were added. Visit xilisoft.com to know more. 3. Support 15 and 29.97 frame rate. And video size like 160x112, 324x248 and 368x208 is adjustable (16:9 full screen on PSP). 4. It supports Bit Rate from 216 to 1500 Kbps. 5. Support output of PS3 Video (480p, 720p, 1080i) MPEG-4, bitrate from 1200 to 3000 Kbps. 6. There are two more options added in the "Profile" list: Excellent Quality & Minimal Size. 7. The software integrates with all video/audio encoders/codec, users can convert all supported formats once download the program. 8. Support batch conversion. You can select all files you want to convert and Xilisoft PSP Video Converter will automatically encode them one by one even if these files use different settings. 9. It can convert any clip or segment. 10.keep the default settings to get the best timbre and image effect etc. 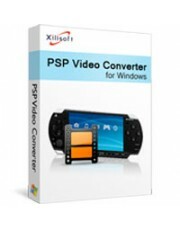 how to use Xilisoft PSP Video Converter?